ThunderNews - Review- What does this Usenet Newsgroups Provider have to offer? ThunderNews is not a renowned Usenet Service Provider, but still, some of its services match the well-known Usenet service providers. The company offers 3354 days of retention period which is one of the highest retention periods in the region. The company also provides more than dozens of plans for its customer including regular and block plans which is remarkable. ThunderNews offers high-speed connection along with 50 concurrent connections. The company doesn’t keep a log of your activities. ThunderNews also offer SSL and VPN which ensure your online protection and anonymity. The company also provide access to more than 107,000 Newsgroups. The company offers more than dozen packages for its customers so you will have enough of choice to choose from. Package holders enjoy the following features on their subscription. ThunderNews offers the following Regular plans for its customers. These packages are billed on monthly bases, but you can also choose for the yearly billing cycle in which you will get up to 40% discount. Unlimited Bandwidth with Premium SSL Encryption for 8.99 USD. Unlimited Bandwidth with VPN Service and Premium SSL Encryption for 10.49 USD. 30 GB Bandwidth with Premium SSL Encryption for 4.99 USD. 60 GB Bandwidth with Premium SSL Encryption for 7.99 USD. 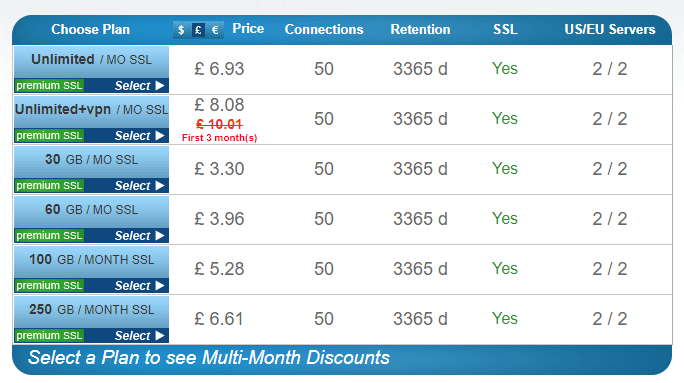 100 GB Bandwidth with Premium SSL Encryption for 7.99 USD. 250 GB Bandwidth with Premium SSL Encryption for 8.99 USD. 25 GB Block Plan for 2.99 USD. 50 GB Block Plan for 5.99 USD. 100 GB Block Plan for 9.99 USD. 200 GB Block Plan for 18.99 USD. 500 GB Block Plan for 36.99 USD. 1000 GB Block Plan for 59.99 USD. ThunderNews is one of the few Usenet Service Providers who doesn’t offer a free trial. If you want to test their services, you will have to be their customer. You can also contact support to request a 3 day or 1 gig Free Trial. ThunderNews offer the 3354 days of binary retention period which is equivalent to 5 years which is great; it is one of the highest binary retention periods in the region. But its text retention period is not great as it is limited to the 1265 days. The company offers the 99% completion rate. ThunderNews offers the high speed to its users. If you are not getting the high speed, you can switch to another server. ThunderNews have the 4 servers, 2 in each Europe and USA. So if you are in the US, you should he US-based servers as it will give you the max speed and vice versa. You can also use the number of alternate ports for better performance. You will get the high speed, but you will be limited to the Data limit. 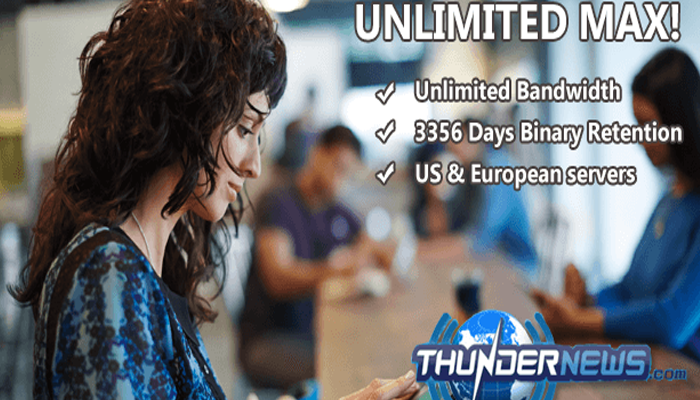 ThunderNews offer that max of 50 concurrent connections on its premium regular plans and premium block plans. On regular block plans, this number drops down to the 10 Connections only. Well if you are new user don’t fall into this trap, a number of connections don't matter so if you have only 10 connections they will enough to max out your connection bandwidth. ThunderNews offers its own customized version of NewsRover to its customers, which is up to date and modern Newsreader. However, you can also choose your favorite Newsreader. ThunderNews support the SABnzbd, Newsbin, Newsleecher and all other popular Newsreaders. ThunderNews is one of the few Usenet Service Provider who provides the free VPN Service to its users. However, the Free VPN Service comes with the high price you will have to pay some extra bucks which are included in the package. So Basically, VPN isn’t free. You can choose other free VPN Services which offer the services for free, or you can opt for the unlimited bandwidth package with the VPN service by ThunderNews for 10.49 USD. ThunderNews offer Octane VPN client who offers the features like DNS leak protection and encryption. So if you are the person who doesn’t like to be monitored, you should use VPN as it will make your online presence anonymous and it will also bar your ISP from tracking your online activity. The company doesn’t keep track of your online activities, and they also don’t share your credentials with anyone. ThunderNews use the standard 256 Bit SSL Encryption for its users. However, SSL Encryption is limited to the Regular and Premium block Package Holders. The standard Block plan holder gets the NNTP connection which is not that great so you can spend extra 1 USD to get the SSL Encryption. You can also use the VPN service for additional online protection. ThunderNews also have the dedicated blog for its customer base. The company interacts with its users on the blog. The blog is used by the company to announce the general news, Promotions and Service Alerts. ThunderNews have the multiple sources of customer support for its users. The company website has the blog section which has many useful articles which can help you. The website also has the dedicated FAQ section which answers the all frequent questions. The company has the 24/7 customer support; you can reach them through the form available in the support section of the website. You will get the ticket number for your query and staff will contact you within 3-5 days depending on the number of queries. However, the support section has the ticket tracking system through which you can track the status of your query. ThunderNews is not a popular service, but it surely has a lot to offer. The company has great retention period which they advertise in their campaigns and on their website, but it is only for the binary retention period, their text retention period is not that great. The company offers a variety of plans for its customer which include the block plans. Block plans are great because you can use them without any time restriction. Block Plans by the ThunderNews are good but not great; their competitors offer block plans with many features which ThunderNews doesn’t offer. Another drawback of ThunderNews packages is that they are limited, for the unlimited package you will pay the 8.99 USD, Best Usenet Providers offer much more for the same price tag. ThunderNews also doesn’t offer any trial period unless you request from support. So if you want to test their service, you will have to pay for it, or you can try other Usenet providers who offer the free trial with no strings attached. You can check the reviews of other Usenet Providers on our website, and we would suggest you start from our Best Usenet Providers.